I just whipped up this bomb blackened chicken with avocado cream sauce and it is deee-lish! Serve it with a side of cilantro lime quinoa and you have a complete meal. Start quinoa first as the chicken doesn't take long to cook. Add garlic to pot and heat on medium high for a couple of minutes. Add chicken broth and quinoa and bring to a boil. Turn heat down to a simmer and add the zest and juice of the lime and salt. Let quinoa simmer for 15-20 minutes until all liquid is absorbed. Fluff before serving and stir in cilantro leaves to garnish. Heat oil in pan on medium heat. Season chicken with Cajun or blackening spice and saute on medium heat for about 5 minutes per side. Cover to avoid grease splatter. 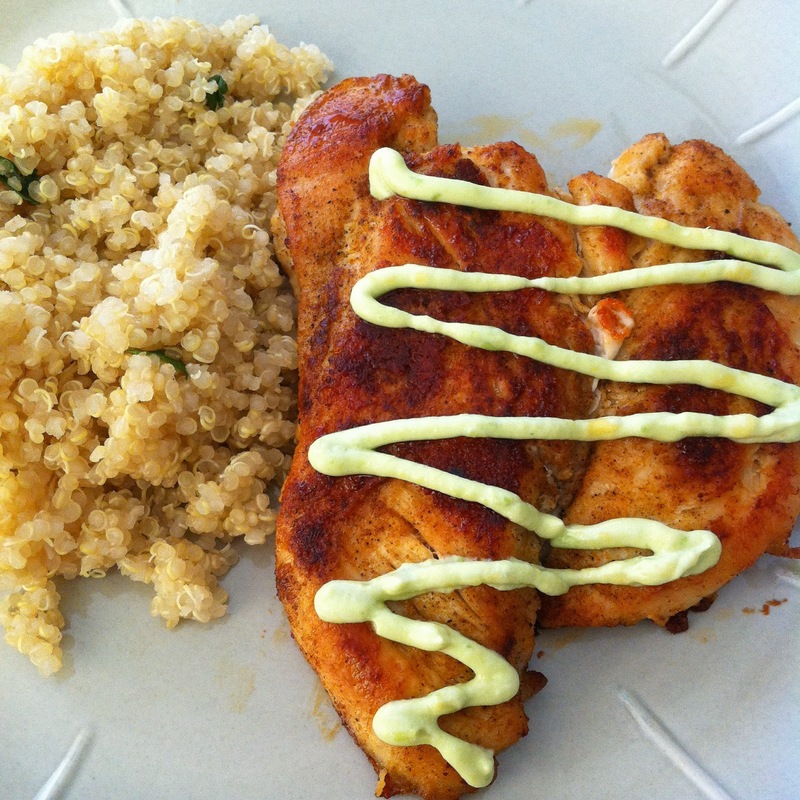 While chicken is cooking, use a food processor or mash with a fork the avocado, yogurt, and garlic powder. Add milk a tiny bit at a time if you want a drizzle-able consistency. Top chicken with sauce when finished cooking and serve. I was about to make the avocado cream sauce for this. In the directions you state "add milk a tiny bit at a time...", but there is no milk in the ingredient list. Did you mean the Greek yogurt, or is there supposed to be milk too? Good catch! Yes, I meant milk. Just a little if you want to thin out the sauce. I'll go in and change it. Thank you and I hope you enjoy it!